Peaches check. Shortcake check. Muffinized yes! The glorious beauty of summer stone fruits, in this case ripe juicy peaches, stuffed into crumbly shortcake all tucked into a muffin form. Break them open hot out of the oven and slather them with fresh whipped cream and more fresh peaches, I mean what can be better? Enjoy these on the patio in the warm summer sunshine. Happiness. I am so obsessed with summer stone fruits and want anything plum, peach or nectarine. Throwing them into my favorite baked goods only extends the pleasure. These muffins take no time to whip up. Butter is cut into the flour creating a biscuit like texture. The fragrant sweet peaches add umph to the dough. The whole thing is just lovely I tell ya! Preheat oven to 350° F. Grease or line 12 muffin cups with paper liners.In large bowl mix together the flour, baking powder and sugar. Cut in cold butter with a pastry blender (or two knives) until it is in small pea-size pieces.In small bowl mix the egg, vanilla and cream. Add all at once to flour mixture. Stir with spoon until just blended. Gently mix in the peaches. 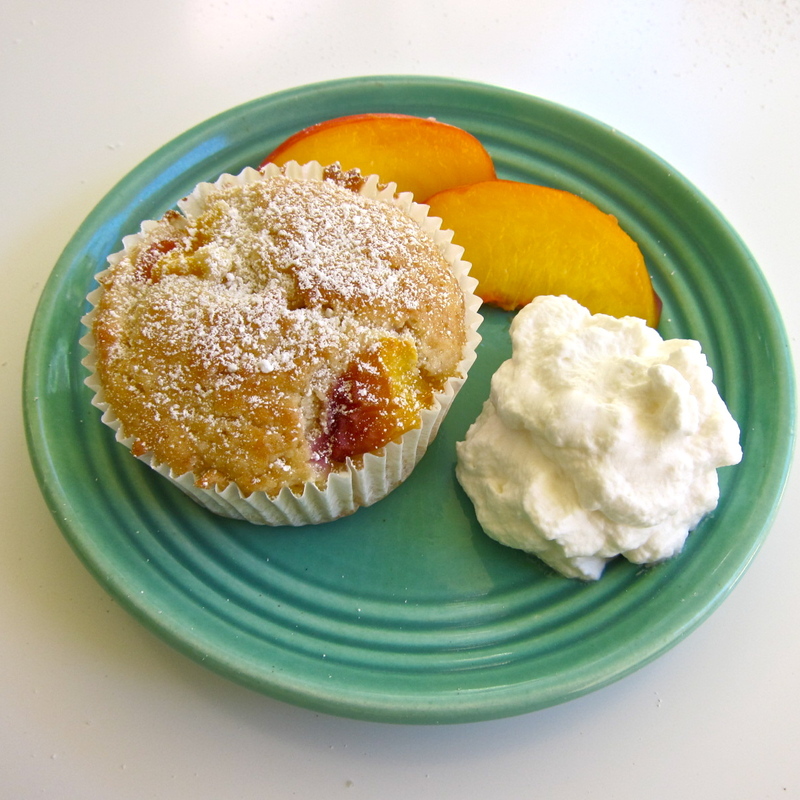 Spoon into muffin cups, making sure each muffin has some peaches and bake for about 25 minutes. Cool completely in pan before removing. Sprinkle with confectioners sugar once cooled. What a great combination! Love the stone fruit … and the poundcake. Way to muffinize this one. YES!!! Bring me one, mang!! I love all your muffin posts, but this one is my favorite so far! Definitely putting this at the top of my to-bake list. Also, it was lovely meeting you at Picca the other night! What are vanilla peaches? The recipe says to be sure each muffin has strawberries. Why? updated! sorry about that the peaches were supposed to be on a separate line but got attached to vanilla.